Tianmen Mountain is approved to be National Forest Park in 1992, has an elevation of 1518.6 meters. It is only 8 kilometers far from the downtown and is one of the most representative natural sceneries of Zhangjiajie. For a long time, Tianmen Mountain not only attracts the attention of the people by its miraculous and unique geographic landform and unparalleled natural landscape, but also well known for its profound cultural connotations and famous colorful humanistic sites. It is revered as the soul of culture and spirit of Zhangjiajie, China. Tongtian Avenue has 99 turns symbolizing that Heaven has nine palaces. It has a well-deserved reputation-a wonder highway of the world. Through Tongtian Avenue, one reaches directly the Tianti - celestial ladder from the top of which a celestial-like scene comes into view. There is a 6-meter wide avenue specially built for this scenic spot. Tourists can make a self-drive trip from the foot of the mountain to the middle station of the cable car, and then they can transfer to the eco-coach to reach the final destination via this avenue. The tourist traffic design of Tianmen Mountain is worth the title of world-shocking masterpiece. It will bring shocking and unforgettable experiences for the tourists. Tianmen Mountain Cableway, Heaven-Linking Avenue, Tianmen Cave and Bonsai Garden in the Air are reputed as the four great wonders. 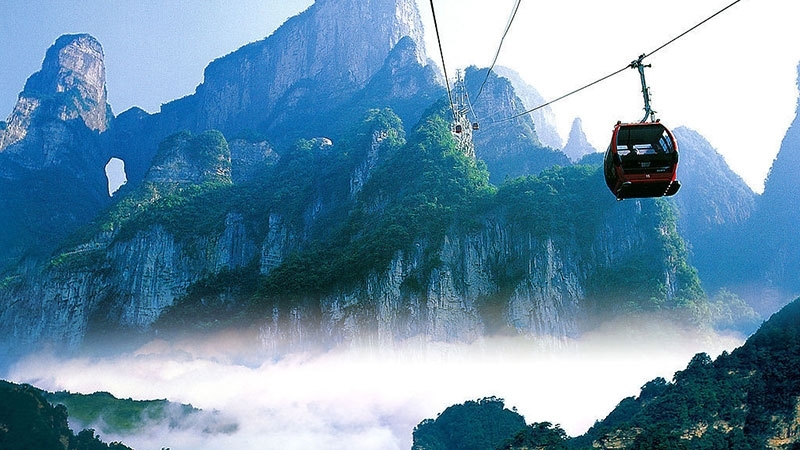 Tianmen Mountain Cableway, the longest one-way recycling passenger cableway in the world, has a length of 7455 meters and a height gap of 1279 meters. It takes the tourists from the atmosphere of modern city directly to the hug of the primitive garden in the air. During the running of cableway, the landscape transforms into a kaleidoscope, making the tourists experience a miraculous feeling of flying angels in the sky as well as of being blended into a long grand painting of landscape. The mountain-winding highway of Tianmen Mountain, nicknamed as Heaven-Linking Avenue, has a total length of less than 11 kilometers. Yet the elevation of it rises sharply from 200 meters to 1300 meters. The avenue rises steeply according to the form of mountain. The 99 blends link closely with each other and pile up in layers, making a pattern of a circling flying dragon reaching the skyline. Tourists marvel at it, which is worth the title of the Top Highway Wonder in the World. 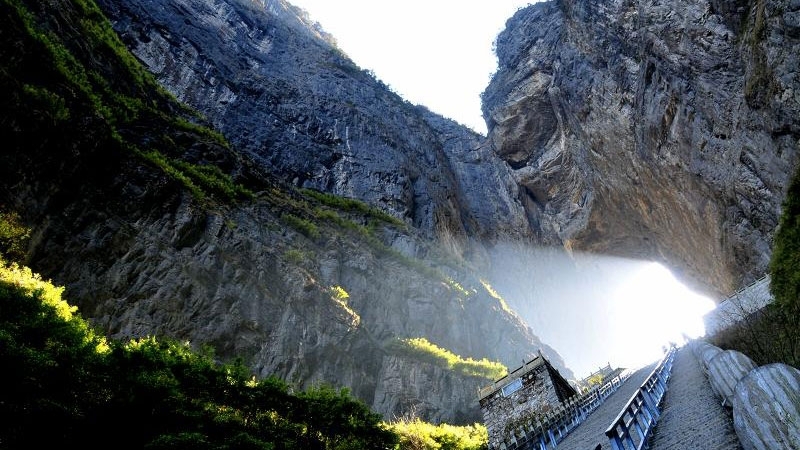 Tianmen Cave is the natural water-eroded cave with the highest elevation in the world. In the year 263(the sixth year of Wuyong Period of Three Kingdoms), the thousand-meter high cliff of Songliang Mountain suddenly broke open into a door-like cave which became a rare wonder of the world. Hence Songliang Mountain is change to Tianmen Mountain. Tianmen Cave runs south-northward with a height of 131.5 meters, a width of 57meters and a depth of 60 meters. It rises above the ground and nears the sky with a lofty and towering posture. The shadow of it reaches the north of the vast sea, the clouds over it near the south of the handle of the Dipper. It's much like a gate towards the heaven. The wonder attracted the visits and appreciations by emperors, officials, sages, hermits, dignitaries and men of letters of different dynasties. After the accumulation over the dynasties, the unique profound Culture of Heaven is built up. In 1999, the masters of international stunt flying piloted the planes to fly through Tianmen Cave. The activity gave rising to sensational reactions in the world. There were 800 million audiences watching the live telecast. Tianmen Mountain Temple was first built in the Tang Dynasty as a center of Buddhism in the area of western Hunan. The present Tianmen Mountain Temple is rebuilt on the basis of the original site with a plot area of more than 10,000 sqm. It adopts an official style of the Qing Dynasty and the buildings in the Temple compare well with the famous classical houses at home. The Temple is located in the mountain hollow with a broad vision. If one gazes into the southeast, all the hills seem to be so small that the Temple is really like an overlord. 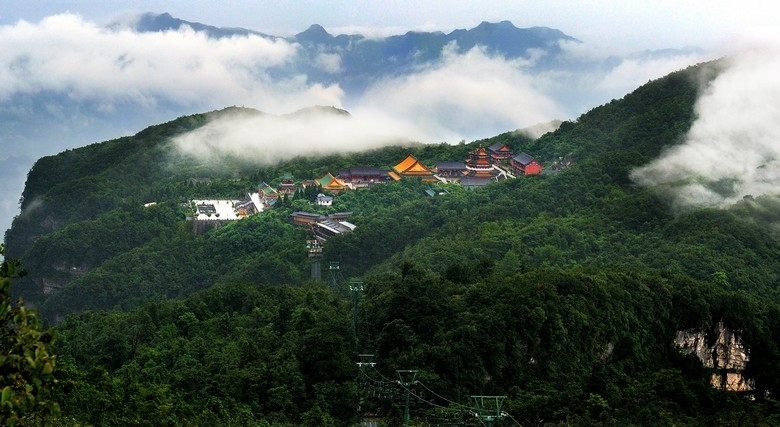 Heavenly Gate Mountain Temple is nestled in a natural hollow in the mountain ridge, providing a modicum of lee from the seasonally raw winds. Since the temple structure is large while all of the surrounding trees are dwarfs (bonsai-sized, though not the potted plant size that fits on your window ledge), it is as if the temple, by its very size relative to its surroundings, achieves its fitting position of symbolic dominance in the mountaintop's larger metaphysical scheme of things. Standing well apart from the temple is a pagoda that you should definitely visit, but which can only be accessed from Heavenly Gate Mountain Temple, either on foot (an arduous climb of 45 minutes!) or via a (ski) chair lift, which will set you back about 25 Yuan. To those who may be on the lookout for a completely different kind of culture here at the temple (think: yoghurt, i.e., food), the temple operates a vegetarian restaurant that lets you fill your plate for a mere 35 Yuan, and the fare is said to be so tasty that you'll hardly notice that it lacks amino acid, i.e., the building block of red meat. Back on the road after a filling meal, take care not to take the wrong turn, else you will soon be back at the upper gondola stop near Yunmeng Fairy Summit. Instead, look around for the trail that leads over to the southeastern face of the mountain (you might want to consult your compass), to Yu Hu Peak. Under the foot of Tianmen mountain, besides of Li river(marther river of Zhangjiajie),this is it--The first international golf yard of Zhangjiajie--Tianmen international Golf Club! You can stay in Zhangjiajie and enjoying golf with beautiful environment around.